The next bridge across the Russian River is the Bohemian Highway (Monte Rio) Bridge (20C0018). This bridge is a strange hybrid with truss elements under the deck, pony truss elements above the deck, a concrete balustrade, and ornate pier walls. 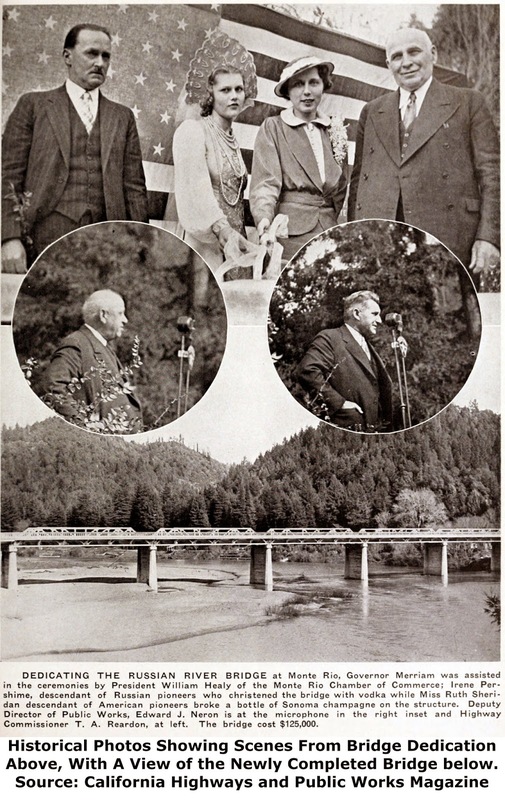 The Historic Bridge Website recounts how the bridge was christened with vodka (by a descendent of the Russian settlers) during the ribbon cutting ceremony with California Governor Merriam in 1934 (see photo below). Monte Rio is an interesting resort area. The nearby Bohemian Grove is the site of an all male club made up of the elite, including former US presidents. The less famous enjoy sunning themselves and swimming on the beach around the bridge site. We'll take a closer look at the bridge tomorrow. Sonoma County, California Bridges: Bohemian Highway Bridge across the Russian River (1) by Mark Yashinsky is licensed under a Creative Commons Attribution-NonCommercial-NoDerivatives 4.0 International License.